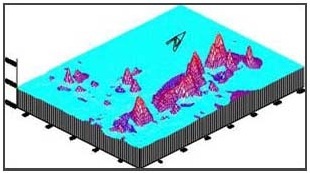 Magnetometry over waste disposal. Extent was unknown. The eastern part shows deposits of household garbage (large, elongated anomaly). 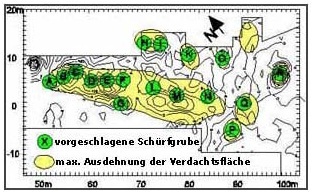 The south-western part shows deposits of construction waste (small anomalies). Magnetometry over waste deposit. Special filtering methods can resolve single bodies. The objective was to find buried drums. Geoelectrical reconnaissance of a deposit of galvanic muds. 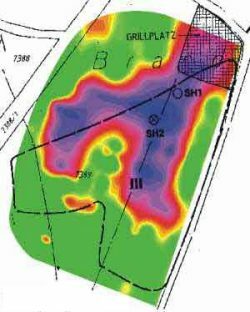 The deposit clearly turns up as an anomaly of low resistivity.